I’ve seen a lot of commentary lately describe conditions as if things are calmed down. 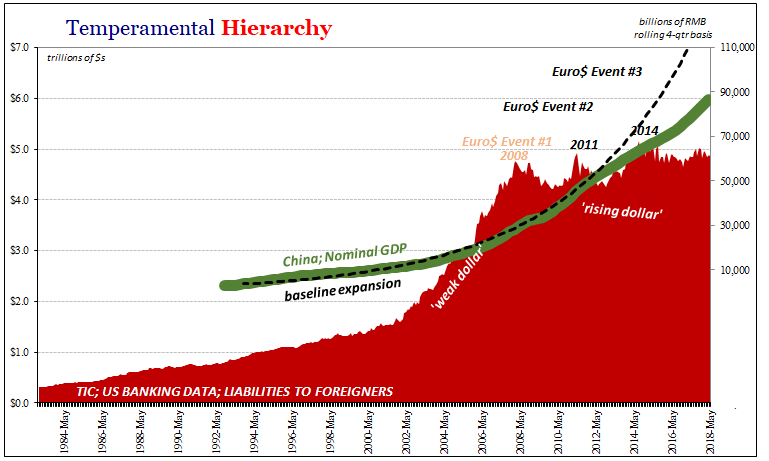 There was a bit of growth scare, a little T-bill indigestion earlier in the year. 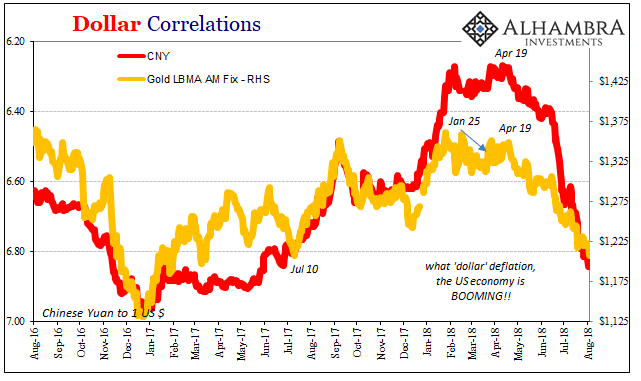 The Chinese are somehow both stimulating their export sector by devaluing CNY, and also controlling the price of gold while they do it. 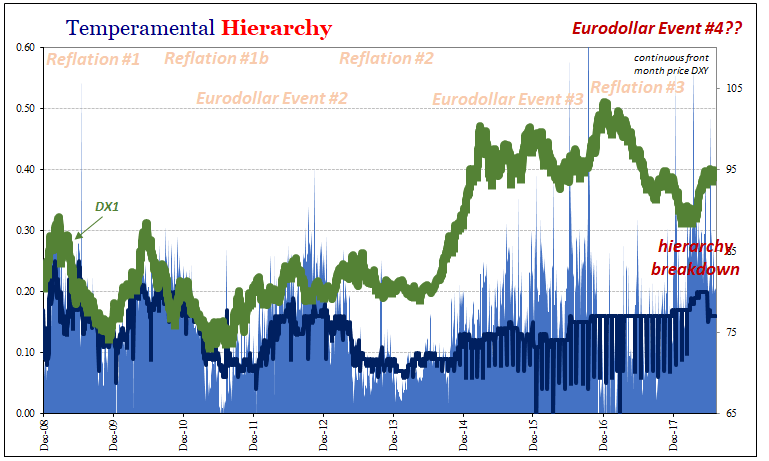 The contradictory inflation/deflation signals have apparently just canceled each other out! There are, in reality, cycles within cycles. 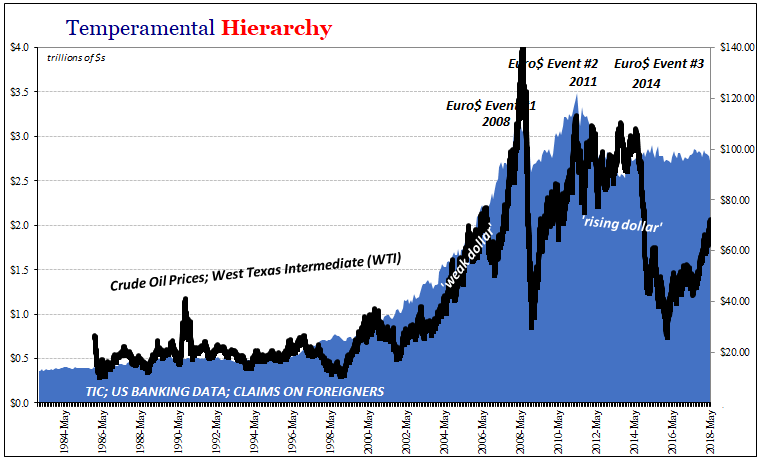 In March 2015, for example, the “rising dollar” paused after its first phase devastated some currencies and commodities (primarily oil, that anyone cared to notice). The economic damage hadn’t yet become visible, so the “supply glut” talk seemed reinforced by a lack of things happening right then. 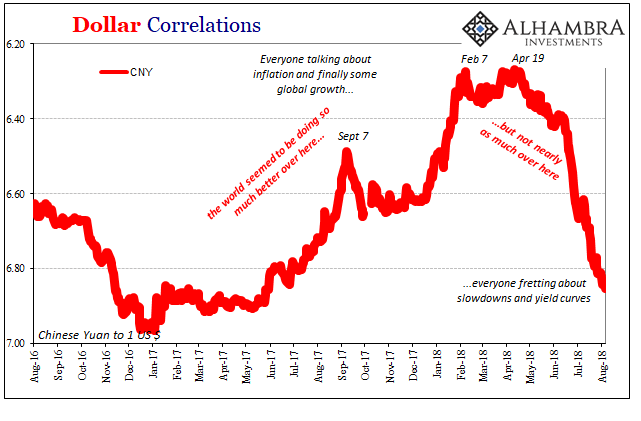 Until that August and CNY, kicking off the second half, or cycle within a cycle, it may have seemed like a lot of smoke with no fire. It was the same way in 2008, too. The panic period can be broken down into two parts, the first finishing up with Bear Stearns’ near demise. In between March 2008 and July 15, optimism bloomed in official and unofficial ways. Policymakers were careful but still spoke especially in private as if their skillful handling of things had warded off the worst cases. Maybe even the US would avoid a recession altogether. At neither time did anyone actually tackle the issue head on. It was, and remains, the very same one which Ben Bernanke ironically spoke about at length in his famous “deflation” speech. Back in November 2002 during the worst of the dot-com bust, then only as a Federal Reserve Board Governor, Ben Bernanke was catapulted into the mainstream briefly eclipsing even the “maestro” himself. The central bank, the future Chairman said, had this thing called the printing press and if ever pushed into a dire position could effectively use it. Thus, the mere threat of using it was pretty much all that would be necessary to stave off any deflationary wave before it started; let alone one that might last for any length of time. People remember the speech for the “printing press” allusion, like they remember Greenspan’s “irrational exuberance” sermon only for those two words. In both cases, what each man had said before the sound bites should have mattered far more in the public sphere. In Greenspan’s 1996 lecture, the future “maestro” warned that Economists were having a difficult time assessing money. Not just monetary conditions, but money itself. He would return to this theme on many occasions, hoping that there would never come a time when it would matter; fretting already in 1996 it might. In the end, it was apparently decided there wasn’t anything to be done about this (fatal) intellectual defect that pure public confidence couldn’t overcome. 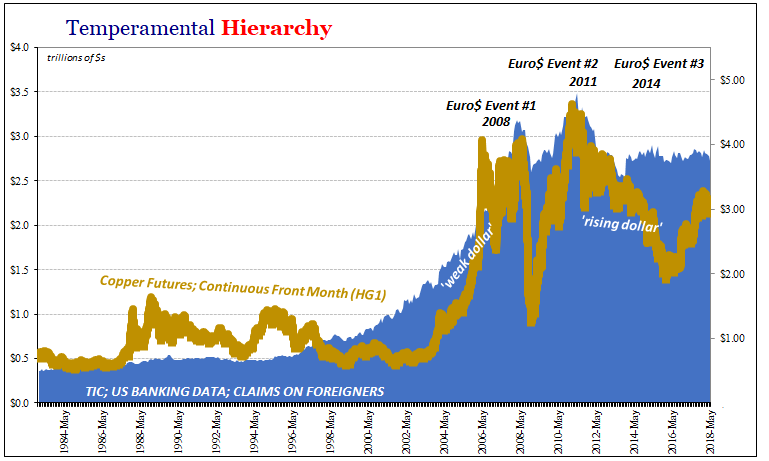 So, Bernanke in 2002 merely continued the thought by suggesting that if these monetary difficulties ever became extreme the central bank would simply turn on the money printer. It never dawned on him, or anyone else, to ask that if they couldn’t actually define money then how might they know for sure the thing they might print in the future was useful money? In truth, they didn’t actually care. Expectations were all that mattered to Economists. 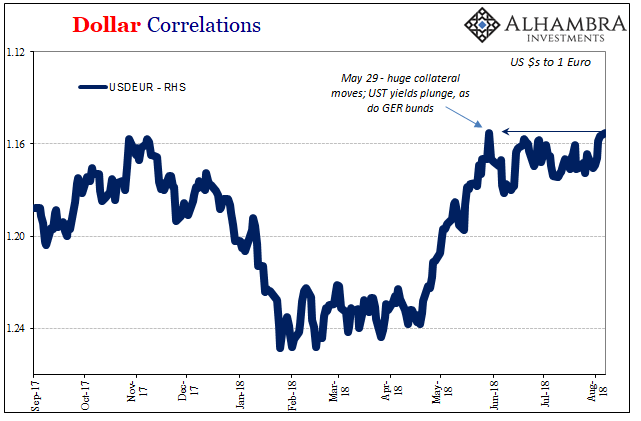 Thus, if you and everyone like you thought that the central bank was printing money Economists really believed it wouldn’t make any difference if they did or not. The Emperor isn’t just wearing invisible clothes, he’s not actually the Emperor, either. But that was all low probability stuff in 2002. 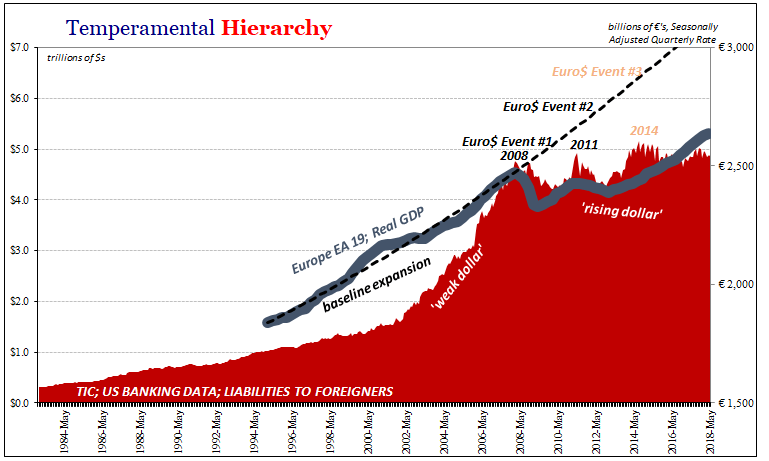 The best way to avoid deflation? A healthy, well capitalized banking system and smoothly functioning capital markets are an important line of defense against deflationary shocks. The Fed should and does use its regulatory and supervisory powers to ensure that the financial system will remain resilient if financial conditions change rapidly. There would never be any use for money printing so long as capital markets were doing well and the banking system performing smoothly as a consequence, so said the people who couldn’t identify money nor capital. If or when that might change, they would print something and call it money even though for decades before they had given up trying to classify any such thing. The result has been a more than decade-long affliction that no one can identify. These molehills of calm are then turned into mountains of recovery that never pan out. Ben Bernanke even titled the 21st Chapter of his revisionist book, False Dawn. How appropriate for August 2008, or August 2010. Perhaps again in August 2018? Never ascribe to malice, or supergenius Chinese long-range planners, dollars which can be explained, easily, by incompetence on both sides of the Pacific. 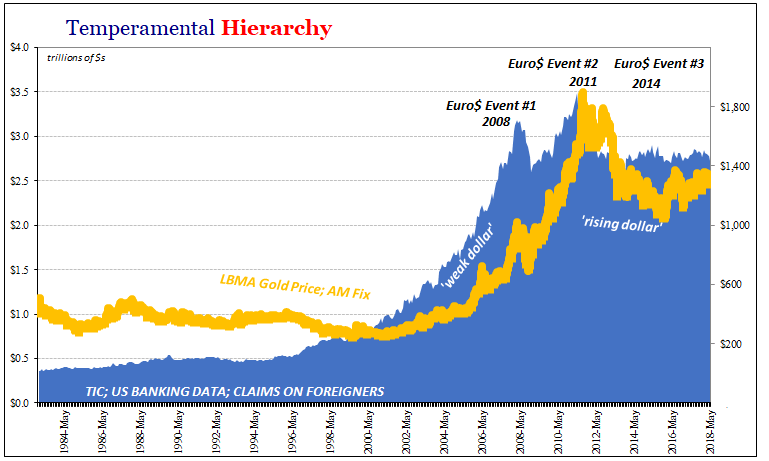 True goldbugs know the difference. Instability is the factor that matters, however it comes. Sometimes, ladies and gentlemen, deflation is just deflation. 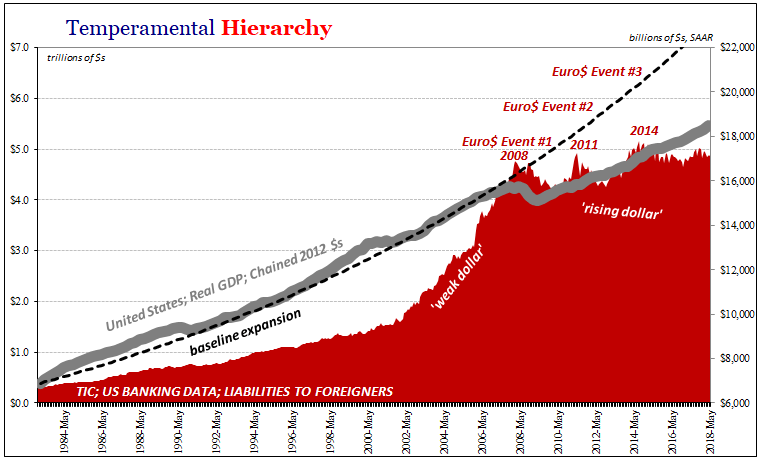 Bernanke was right. He should have stopped it before it ever started. 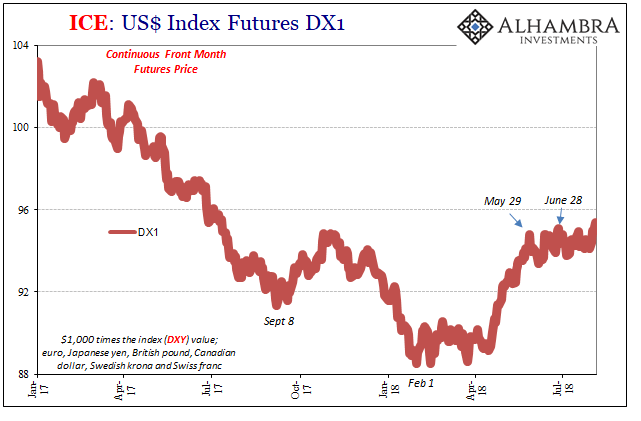 It would have required an entirely new economic doctrine, but the price we are paying for not having done that continues to rise with the dollar. Enjoy the boom.